This 144-page pocket-size fact book is as entertaining as it is informative. Each page includes an interesting statistic, a helpful definition, or some other noteworthy morsel of data from the Old or New Testament as well as a playful cartoon illustration. The tidbits of information are organized in the order they appear in the Bible, giving young readers a feel for the storyline of Scripture. How tall was the Tower of Babel? Can the City of David really fit inside the Superdome? What cool things could Jesus do after the resurrection? 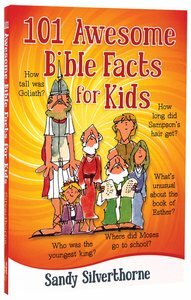 ^Answers to these questions and 98 other interesting facts will whet young readers' appetites and help them become Bible experts in no time! About "101 Awesome Bible Facts For Kids"